Their is nothing quite like a hearty bolognese sauce on top of pasta. I might be a picky-meat-eater, but there is one thing I love, it’s bolognese sauce. My mom was never one to make meat sauce growing up. I think it was partly because I was so anti-meat at a young age. I wish I could tell you a story about how this recipe was passed down from my grandparents who immigrated from Italy, but its not. As I got older I started experimenting and figuring out what worked and what didn’t work in a bolognese sauce. I tried countless recipes and finally found one that I really enjoy. What I can tell you is that I’ve learned to make a big batch of sauce. I serve half the sauce up that evening with dinner and then freeze the rest for a rainy day. The sauce freezes beautifully and you can put it in the refrigerator the day before you want to serve it to thaw it and then reheat on the stove top! I love this sauce best with my homemade spaghetti recipe, although any pasta works fine. Whether you just top your spaghetti with bolognese sauce or use this recipe for a hearty lasagna–either way your meat-loving heart will be content. This is a great recipe to entertain with. Make the sauce early in the day and just let it simmer on the stove—let the saucy aroma fill your home. In a large pot, heat olive oil and butter. Then add onion and carrot and cook until onion is translucent about 3 minutes. Then add the garlic ground beef and ground pork to the pot. Cook on medium heat, breaking up the meat for 10 minutes or until the ground beef and pork are no longer pink. Once the meat is cooked add in the crushed tomatoes, can of tomato paste, dried parsley, sugar, red pepper flakes, whole milk, and salt and pepper to taste (I like to add 1/2 teaspoon of salt and pepper at a time). Mix well, place heat to medium-low, and let the sauce simmer for 45 minutes, stirring occasionally. Once the sauce has thickened pour it over pasta and garnish with fresh parsley, basil, and parmesan cheese. I can food like this everyday, so can my family, especially with a big hunk of bread. Mmmm bread for dipping in this sauce is the best, Cathy! Like the addition of some pepper flakes. Looks like a lovely sauce, making me hungry! We always had it, but it was simply spaghetti sauce with meat. I would love to update it for a real from-scratch version. Awe you must try this then Ashley! You’ll love it!!! Danielle, if i get started early in the day then I’ll let it simmer for hours but for a quick meal I can make it on a work night and it still tastes like it was simmering for hours! I always make big batches of sauce too. I can usually get two more dinners worth, plus I freeze some in smaller containers to use for pizzas. I haven’t made a bolognese in forever!! I love big batch sauce recipes!!! This looks so good, Katie! Pure comfort food! Thanks Georgia! I agree nothing better than pasta and meat sauce! Yum! When I was a kid, we would make huge batches of spaghetti sauce in the crockpot and have a bunch frozen for quick weeknight meals. It was one of my favorite dinners. Love the idea of making sauce in the slow cooker! I love having sauce on hand to defrost and make on a busy night! This is the first recipe I have made from your blog. It was delicious! Definitely a keeper. It makes a lot, too, even after lunch leftovers. I froze it for a one of those “I’m not cooking tonight” moods. Thanks! So glad you enjoyed it! 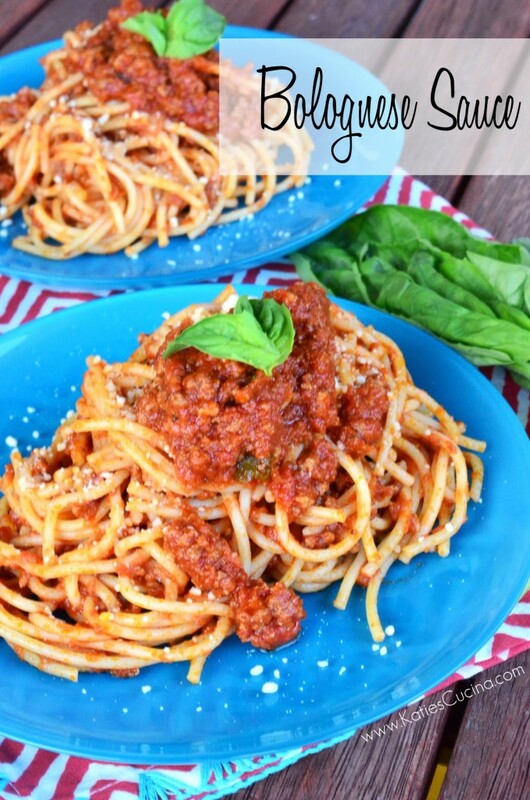 I love this bolognese sauce recipe. I too do the same thing, freeze as much as possible for the “i’m not cooking nights”. Even food bloggers go through them! Thanks Brandy! 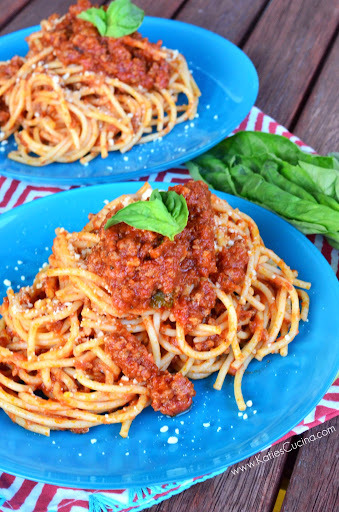 Agree–love me some bolognese!